I find one of the most common directionals used by handlers is the Get Out command. I also believe that very few handlers put in adequate training work with the command so that the directive has a high fail rate in competition. We practice the Get Out until the dog understands the word. And when I say “word” I mean as much the movement that accompanies the verbal as I do the verbal itself. Over time the well-practiced dog and handler team might rely to a greater extent on the verbal. Though I’d have to be in a hell of a hurry not to speak with my movement and rely only on a verbal directive. In a simple introduction of the Get Out I sit my dog addressing a jump that is not really the target jump. Instead I want him to increase lateral distance from me as I encroach on his path and give him the command to Get Out. As soon as possible (after a couple dozen reps maybe) I’ll introduce more compelling movement to the moment of the Get Out. While the jump gives me the movement that I want… the table creates the square. Periodically I like to take a “smart aleck” step to see if my dog is really learning a Get Out… or if he’s being patterned to the sequence. Now is a good time to introduce the contrary movement when the handler has the body magnet position on two choices. I’d be inclined to give my dog a subtle counter-rotation after the #1 jump to insure that he tucks up close to me. Note that I’m conditioning two words or phrases in the development of communication with my dog. The encroaching step means bend away; the counter-rotation means stay in tight. Did I mention that I like to practice every skill to be ambidextrous? Okay, in this change in the exercise I’m asking my dog to Get Out right, where the previous repetitions have been Get Out left. I’m probably moving along a little fast here… I would likely condition the static start with just the two jump choices before I do this step. Now I’ve opened up the floor for a little additional movement. I’ll endeavor to approach the #3 jump with dog-on-left and have a station forward of the dog so that I can take the encroaching step to get the dog out to the table. 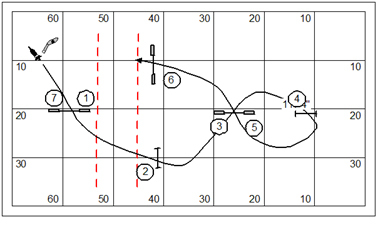 This likely means I’ll use a Front Cross between jumps #2 and #3 to tighten the turn. And again, in the interest of practicing the ambidextrous skill, I’ll approach the #3 jump with dog-on-right and take the Get Out to the right into the weave poles after jump #3. To tighten the turn I might use a static Post or an RFP. If the turn after jump #2 goes too wide then the Get Out will be more arduous. Now we return to the left-bending Get Out on the dismount of the A-frame. This is likely to work quite differently for dogs that assume an unambiguous finish (like a 2o2o) compared to dogs that have a running contact. There’s also a bit of a taste of the “smart aleck” step here. Remember my advice that when the handler has the body-magnet position on multiple options an RFP serves as insurance to take the nearer obstacle. And it is the nature of insurance that they are unlikely to sell you the policy while your barn is burning down. I like to finish any grueling dog training session with a good ripping handling exercise. The opening series of jumps provides an early opportunity to practice a Get Out as in an earlier exercise. Beyond that, it’s just another handler riddle. Spring means that I have bunches of chores to do outside. Today I moved my “started inside” plants out to enjoy the 70° sun… and then of course trudged them all back in as the sun tipped down. I also built a bon-fire in the lower field. I’ve been picking up a ton of dead-wood and killing a fair share of invasive vines and multi-flora rose as I test nature with my peculiar sense of order. I’m simply not getting around to everything I need to do. But it’s far easier to forgive yourself when you’re doing honest work and have a warm sun on your back. Who is the lady in this picture? And, what is her significance to the agility community? The first correct answer, posted as a reply to this blog post, wins a free copy of the March Jokers Notebook. Questions comments & impassioned speeches to Bud Houston: BudHouston@hughes.net. 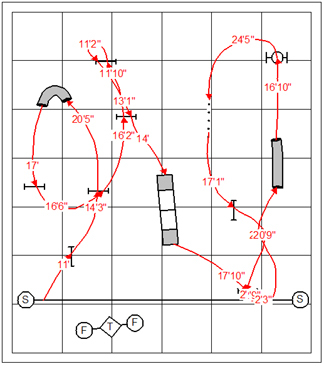 Check out my latest publication the Jokers Notebook ~ Dog Agility Distance Training Plan – March 2010 available on the Country Dream Web Store: http://countrydream.wordpress.com/web-store/ . Readers of my web log get a discount: Enter “special03” in the box for the discount code. And that will take $5.00 off the price of the order. Power and speed, a British import game, is the Irondog competition of dog agility games. 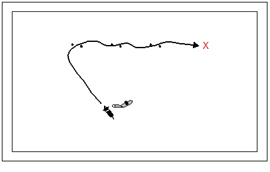 The game demonstrates the ability of the handler to exercise tight control (power) through a part of the course, then show loose control (speed) over another part of the course. The course is split into two sections Power and Speed. The Power section contains the power obstacles, the weaves poles, occasionally specialty hurdles, possibly a tire, and the tunnels. The goal of this side is to have the handler negotiate his dog through the course without faulting. There is no course time for this part of the course. 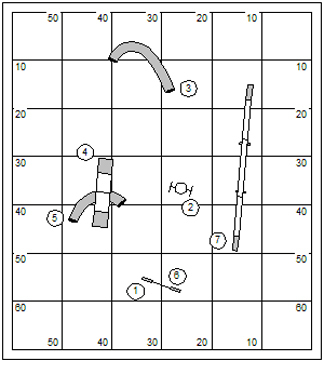 Faults earned in the Power section will be added to the dog’s overall score. The Speed section contains a straight forward jumping course. Here the scoring is on a time plus faults basis. Scoring Power and Speed comes from the speed side only. Thus, if dog one ran the power side in 40 seconds and the speed side in 35, his total score is 35 seconds. If dog two ran the power side in 30 seconds and the speed side in 36 seconds, his total score would be 36 seconds. Dog one would win, even though dog two’s power side, (and consequently his total time) was faster. Power and Speed is judged time plus faults in the Speed section since in order to get through to this section you must complete the Power section fault free. The class is scored on a time plus faults basis—fastest time wins. Refusals are faulted as are dropped bars and missed contacts. The first section of the course—obstacles #1 through #6—is not timed. However, a handler will earn a 5-second time fault for any mistake. If, for example, a dog misses the contact on the A-frame his score would be 5 for the first part of the course—obviously, the ideal score for #1 through #6 is 0. The timekeeper will start the stopwatch at on the approach to the first jump in the Speed section. Any time faults earned in the first part of the course are added to this time. The Power section is not timed at all. What you would do is put the start-line on the approach to the first obstacle (typically a hurdle) in the speed section. 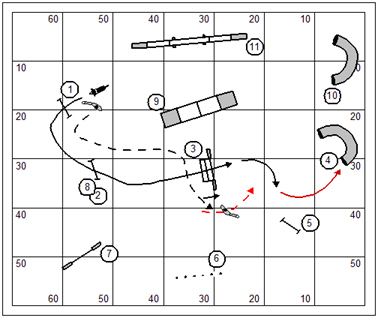 To tell you the truth the biggest error judges are making with this game is putting obstacles that belong in the speed section… in the power section, and so trying to do too much stuff in the power section. Power might include three contacts, a set of weave poles and maybe a tunnel for shaping. The Power section should be handling neutral. It’s not about sequencing; it’s about the dog demonstrating his skill on the technical obstacles. The speed section, on the other hand should be a wide open ripper of a jumpers course; presumably with nifty handling challenges. There should be an SCT; but it clearly would be based on the speed section. 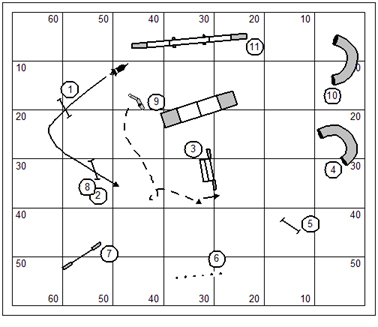 A well-designed Power and Speed course might end the power section with a contact obstacle (like the dogwalk) to give the handler time to maybe take a lead-out into the speed section while the dog maintains a solid bottom on the contact. A good placement for this game in the running order of a trial is right at the beginning, before the standard courses and any other game. This allows familiarization with the contact obstacles; and, it allows the handler to demonstrate (to his dog) criteria for contact performances. This matter of discipline might erode (on the part of the handler) in the standard classes when the handler feels rushed by the pressure of time and competition. This little fish is in danger of extinction. What is this fish? 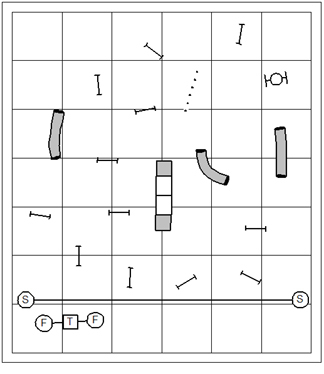 The Glossary of Dog Agility Terms describes two types of directional commands. absolute directional ~ A directional command that directs the dog which way to move based on the dog’s position, regardless of the handler’s position; for example, Left and Right, which tell the dog to turn to his left or right, respectively. 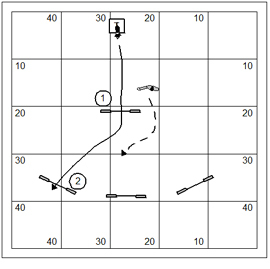 relative directional ~ A directional command that directs the dog which way to move based on the handler’s position; for example, Come and Get Out, which refer to moving toward the handler and moving laterally away from the handler, respectively. Most agility handlers have not endeavored to teach their dogs absolute directional commands; preferring instead to run with the dog and to direct the dog with close-at-hand movement. For dogs that are considerably faster than the handler, the ability to direct the dog with “Left” and “Right” commands, and arguably a good “Go On” are necessary for simple survival in the game. It’s fairly easy to make a test of which system might be workable, given either system. This is a pinwheel, with a serpentine jump on the corner. If the dog understands his absolute directional commands, then the handler should be able to give the command for the change of directions after jump #3 from just about anywhere. 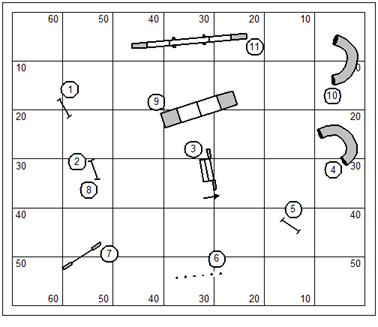 If the dog is limited for the most part to relative directionals, then the handler might have to reserve room to step up inside of the pinwheel to show the change of directions after the #3 jump. 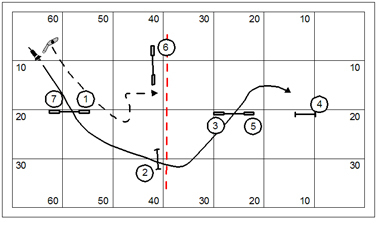 The turn from jump #4 to jump #5 isn’t an automatic. The dog with powerful obstacle focus might be studying the #2 jump in that transition. And so, whether using absolute directionals or relative, the handler needs to give the directive to the dog to continue turning after jump #4 to get back into the pinwheel. When using the relative directional to turn away the handler must be careful to be in the dog’s field of vision. The timing of the movement must coincide with the moment of the dog’s jumping. And, to complicate matters, the handler must reserve enough room to take a step to indicate the turning direction. The Tandem Turn is not an arm signal alone – if it is an arm signal at all. It is more a matter of the rotation of the handler’s body and the step in the direction of the course. This is a great illustration of the idea that the dog turns when the handler turns not where the handler turns. We’ve moved the containment line slightly forward for the introduction of the movement. The handler should be careful to give the verbal directive “Turn” (or “switch”, “back”… whatever you’ve reserved to mean turn away from me) because as the exercise progresses to greater distances the verbal will be move obvious to the dog than the rotation and movement that the handler provides. Good dog training is often based on patterning of a behavior. By doing the same thing over and over again the dog gets to be right and earns heaps of reward in the process. The dog’s success in this exercise should be taken with a grain of salt. The question will ever be whether the dog is repeating the performance because he’s learned the sequence; or is he indeed understanding the handler’s movement directive even as the distance increases between dog and handler. 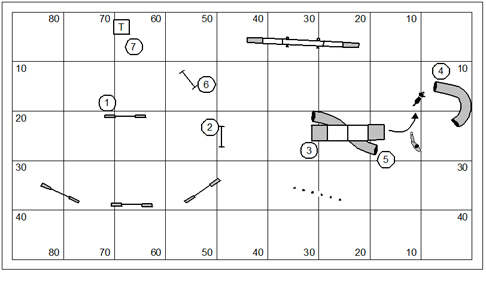 What is the most commonly used agility term that is not included in the Glossary of Dog Agility Terms (http://wp.me/PmSZZ-5V)? The best answer that includes an agreeable definition, posted as a reply to this blog post, wins a free copy of the March Jokers Notebook. We’ve finally begun our weave pole training in earnest. The foundation for the weave poles performance will be on 2×2 poles. In this drawing I’ve got three sets of two poles set about 7′ apart. The red “x” represents the position of the reward. The concept is to teach the dog to drive forward in anticipation… rather than drawing out of the weave poles perpendicularly, in anticipation. It’s really a trick of timing to toss the Frisbee (which I mostly use) so that Kory commits to finish the performance and will drive forward to get the reward without having to look back (in anticipation). The interesting thing about the 2×2 method is that it reemphasizes the entry to the weave poles as each set requires entry. As soon as Kory started showing understanding and drive, I started incorporated movement and pretty much resolved not to support him through the performance. “Supporting” him would be measuring stride alongside him, flapping my arms in rhythm, or singing some kind of doo-dah cadence. I can play with various approaches; increasing lateral distance; back crossing… the whole gamut of the kinds of thing a handler would like to do if the dog indeed owns the independent performance. You’ll note that the poles are slightly rotated to be open to the dog’s approach but not so much that he can trot through them without actually weaving. Typical of my training method my correction is simply to break off and deny the reward. Kory is a clever enough boy that he quickly figures out what he needs to do to earn the reward. I figure that If he can’t figure out the performance then I really haven’t done my foundation work. And I’ll go back and fix it, if that’s the case. I’ve always been a considerable advocate of training wires for the weave pole. The only real problem with wires is that they tend to foster a “macaroni” performance. And so it is worthwhile to go to staggered poles to build the dog’s speed and footwork. Now I actually foresee never going to a fully wired set of 12 poles with Kory. However, what I will do is gate the entry and the exit in order to accomplish some of the more advanced handling objectives. Kory is learning the weave poles at a phenomenally fast pace. After only a couple weeks of work he’s doing a full set of 12 weave poles. His performance in the poles is not completely reliable… but I’ve only had him on weave poles for a couple days. I do believe he’s on his way to being an agility dog. 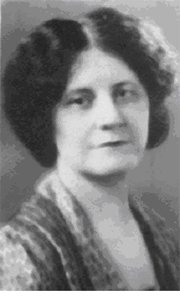 She was the last woman to succeed her living spouse in the U.S. House of Representatives. Who was she? A “dog’s choice” game implies that the game, or portions of the game are run in the order and direction of the handler’s choosing. Essentially he designs the course strategy for the dog. Copycat: Immediately repeating an obstacle of the same value is faulted. Weakest Link: Every obstacle performed much be worth as much as, or more than, the last. Gamblers/Dare to Double: Obstacles can be performed only twice for points. 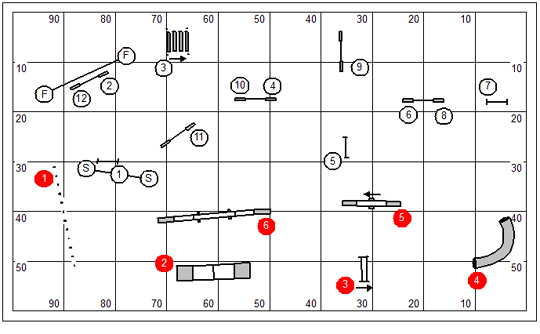 Snooker: Red hurdle then one (and only one) numbered obstacle. Repeat until all reds have been returned. Last of the Mohicans: The dog’s path may never cross itself. This list could go on. The quick grasp of the constraints of the scoring system shapes the dog’s path envisioned by the savvy handler. To the course designer’s point of view the obstacles are placed randomly around the field as it will be almost impossible to envision every strategic attack on the course. So we just plunk them out there and let the exhibitors do with it as they will. As often happens in a dog’s choice games… the obstacles are really too spread out. The course will not have the neat transitional distances between the obstacles that we expect from play in the TDAA. What I will tell the judge is to devise two or three rational strategies for play of the game. 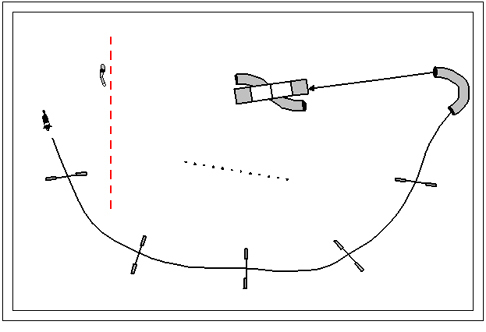 Then use those strategies for setting the spacing between obstacles. 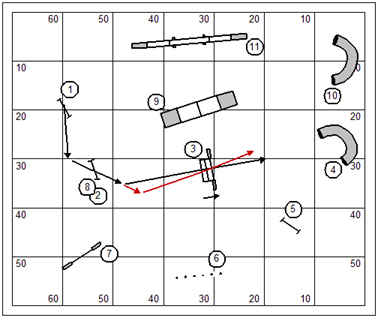 In some cases it might necessitate adding new obstacles to the course to give more flow and scoring opportunities. By the way, you’ll note that the first thing I did is open up that start line so that it’s not tightly defined at one place on the field. What we want to encourage in any game is an abundance of different strategies. And the more we narrow and constrain the options, the fewer options there will be. That’s logical, no? I’ve drawn on this course a willy-nilly line without real thought to order and direction or any constraints of rules. This is a very basic test of the transitional distances between obstacles. The only rational distance on this entire course is the interval between the two jumps to nowhere upper left of the A-frame. This course is way too spread out for the TDAA. But we really knew that without this analysis. Oh… and once you’ve drawn it by hand… open the properties dialog box again and click on “Fit to obstacles automatically now”. Fortunately there was only one contact obstacle on this course otherwise I would be forced to do this analysis for each and every that we included. 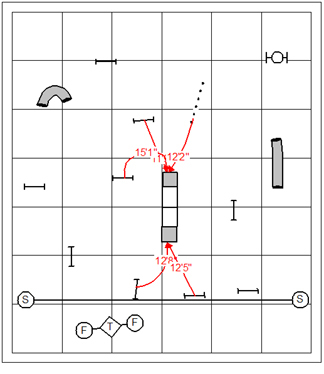 I am concerned with the square and safe approach to a contact obstacle. And so, I will arrange the conceivable approach obstacles so that the square and safe is nearly implicit. Note that the distances from the A-frame to the obstacles surrounding it are in the upper range of transitional distances for the TDAA. The upper end is pretty much where you’ll want to operate in a dog’s choice game. What I would really like to do in a “dog’s choice” game is create a multiplicity of options. 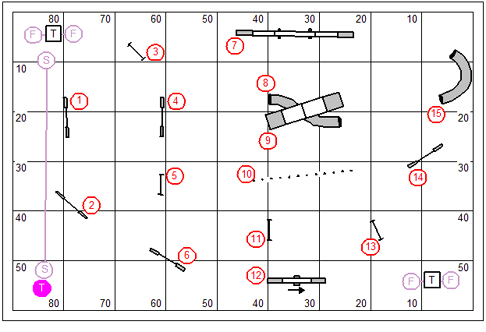 And without making this too complex at all I’ve started with the obstacles surrounding the A-frame (which becomes the anchor object on this course) and visualize at least two options for direction on the approach to or on the dismount from each. This now will shape both the spacing and positioning of obstacles. This is what I ultimately came up with. I wanted the handler to have almost constantly more than one option for order and direction while keeping it safe as can be reasonably assured. I added some jumps to the course; and I added a pipe tunnel (taking out that dead jump that was between the A-frame and the pipe tunnel on the right). I found the tire to be problematic in this course and so put it in a flowing loop that had no rational options to force the square approach. The “jumps to nowhere” got folded back in to the course. The reason the jumps really weren’t going anywhere in the first place was the u-shaped pipe tunnel introspectively turned back in on itself. So I just opened it up so I could share it with the rest of the field. 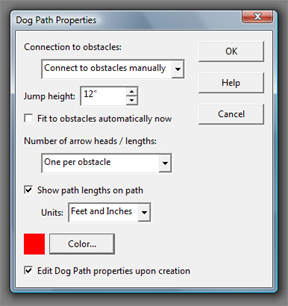 What you don’t see is that I numbered several potential dog paths and used the CRCD path tool to give a bit of analysis to the interval distances between obstacles. It’s a bit more loosey-goosey than a standard course; but a heck of a lot tighter than what I started with. Use of one-directional obstacles: spread-hurdles (which we don’t use in the TDAA); teeter; and collapsed tunnel (which shouldn’t be used in a dog’s choice game anyhow… because of the complexity of chute fluffing). Arbitrarily making obstacles one-directional (a mistake designers of FAST courses often make). The editing of the original composition presumes that I actually get to add obstacles. I did not proof the path for strategies for any particular game. Naturally the course will be based on a specific game; and so all of my strategies will coincide with the rules of that game. 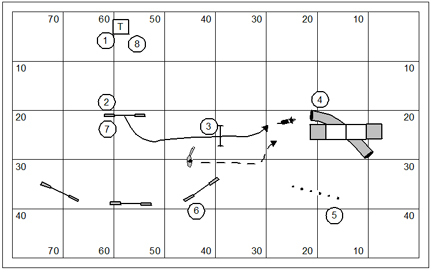 Note too that in the course-designers analysis for the coherence of a design for a specific game the analysis should include a measurement of the dog’s path against the established course times and qualifying criteria. A modest strategy well executed should deliver a qualifying score and will measure at a commensurate length with the YPS of the respective level. Where will the TDAA Petit Prix be held in 2014? I’ll have to apologize in advance for not posting a new lesson for the TDAA’s course design college today. I have an article I’m working on that’s just not done yet. Tomorrow maybe? Yesterday I had a bit of a revelation… my building is too small. I’m going to have to take equipment down into the lower training field where I have more on the order of 10K ft sq to work with. I’m already sending my boy Kory the length of the building, testing the “Go On” command. This was the basic set of the floor lat night. 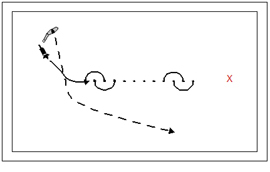 The curl of the line of jumps pretty much works with the dog’s tendency to curl back to the handler’s position. I’ll deal with the prospect of straighter and farther at a later time. While I show the send line way back by the first jump, I did some conditioning of the send starting from the third jump. 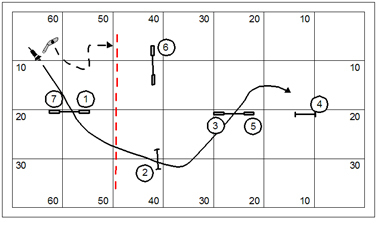 I was especially interested turning him back out of the of the curl of jumps using a directional “Right” command. In the beginning Kory had a couple/three slight errors I had to train through. One tendency was to back-jump the turning jump. 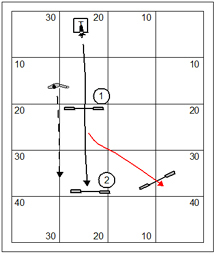 He also turned when I gave the pre-cue directional rather than continuing to the turning jump a couple of times. And… several times he continued an extra jump before making the turn. The way I deal with error, btw, is to deny the reward. Yesterday we were working with a canvas/rope Frisbee; which I would throw, and then give him a game of tug when he returned to me. So if he offered wrong, then he got neither the throw nor the game of tug. Kory is quite clever in figuring out the rules of a training game. Of course he never has to be apprehensive about guessing wrong. It’s all win/win for him. In asking Kory to turn “Right” out of the curl of jumps I worked awhile forward-chaining the behavior. One jump, turn right; two jumps, turn right… and so forth until we were working down the entire line of five jumps. I also played a bit with turning him to the left so that he’s not always conditioned to turn out and away. What was interesting about turning to the left is that I had to give him another supplemental “Left” as he came around the wing of the jump to look back in enough to see the next jump returning back to me. I especially had fun proofing my 2o2o contacts with Kory coming to me over the A-frame. He has such a high reward association with the contacts right now that I wasn’t surprised at all that he nailed this every time we did it. Just so you know, I’m working my young 13 month old BC pup at 16″. And if this whole thing seems like a lot of hard work for a young dog… I agree. I believe it’s my job to make sure he’s well developed both physically and mentally. And frankly I’m finding that the best way to keep him from bouncing off the walls in the evenings is to allow him to appreciate the prospect of relaxing and recuperating. That’s right, I fully intend to give him a good physical workout just about every day so he gets in the habit of being chill in the evenings. The work I described above was not the extent of our workout last night. I also reserved work in the weave poles. But I really should save something for discussion in the Jokers Notebook. Right? What college football team (same year) has the most players inducted in the Pro Football Hall of Fame? What year did they play? What bowl game did they play in that year? I guess it’s no secret I’m a bit of a movie buff. It is a curious kind of lazy indulgent hobby that might be analogous to wading through a field of muck (picture hip high boots here) in search of the occasional pearl. It’s the pearl that makes it all worthwhile. I watched Twilight a week or so ago. And I understand now why it was such a complete rave with young people. Most movies these days targeted at teenage viewers are bad formula pieces that portray kids as vain, violent, stupid, and shallow. Twilight was nothing of the sort. The movie was smart, the characters were real, and the plot was compelling. It was a vampire movie though, probably representing another important evolution of the genre: Bram Stoker’s original; Bela Lugosi’s Dracula; Steven King’s Salem’s Lot; Anne Rice’s Interview with a Vampire; and now Twilight. Each evolution will be copiously imitated. Note that each imitation will be less artful than the last. Who really remembers Count Yorga Vampire after all? The best answer, posted as a reply to this blog post, wins a free copy of the March Jokers Notebook. 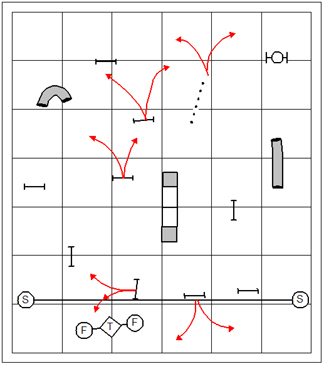 Game for the Week ~ What’s My Line? Named after the old television game of the 50s and 60s, “What’s My Line?” presents the obstacle course in the form of a puzzle. The game provides all handlers the opportunity to come up with a strategy for running the most efficient course possible. In the U.K., this game is known as Take Your Own Line. The handlers objective is to direct his dog to perform all of the obstacles on the course without repeating any. Time starts of the Start line and ends on either of the tables on the field. 5 faults: dropped bar, missed (down) contact, missing a weave pole. 10 faults for repeating an obstacle (4-paw commitment), or failing to perform an obstacle. Sort-the-bodies method: The judge calls out the numbers. 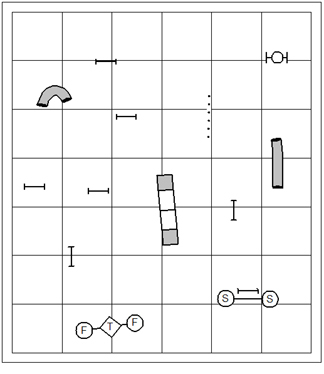 The score-keeper will determine if the dog has repeated or omitted obstacles. Mind like a steel trap method: The judge will keep track of the dog’s performance by visualization of the flow, and will report faults to the scribe at the end of the dog’s run. On the Sunday mini-clinic yesterday I was proud and pleased to see the distance skills of my students. Because of the distance curriculum (reflected in the pages of the Jokers Notebook) I’ve managed to inflict on my students a nearly relentless program of independent obstacle performance and work at a distance. It’s proof to the pudding of the essential truth of dog training. A good training protocol isn’t something you “try on the weekend”… it’s something that is a part of your life and your relationship with the dog. And now, after three-months of routine distance exercise we’re seeing fruition of the plan. Dogs that might have been called Velcro at the beginning of the winter are now happily working at impressive distances from their handlers. Of course I must make the observation that Velcro is a two-part fabric and it takes both parts to get a good stick. The reason for the game this week is to build in my students an analytical keenness for the “dog’s choice” game; that is, a set of obstacles that may be performed in the order and direction of the handler’s choosing (or the dog’s, depending on who is in charge of the team.) This is a useful skill in games like Gamblers. It’s an up-hill battle to be sure. The idea of doing your own thinking… not having numbers to follow will make one’s brain explode. And I’m not too sure that’s accommodated by my insurance. What is the winning strategy for this game? We will presume an effective execution of the plan. 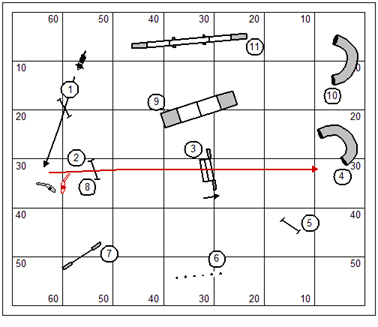 Over the years I’ve toyed with the idea of a “Fast Dog Trap” in my course design. The question is: if designing for a Masters Class should you design with a presumption of mastery? What I’ve learned is that this kind of design just gets you in trouble with handlers with great dogs because their dogs won’t be able to bail them out when the test is really of the handler’s analytical understanding of the challenge and the keenness in their handling to pull it off. I could write a considerable essay on the subject; but not today. With my young boy coming up, I’m thinking quite a bit about the Fast Dog Trap. The allure is to design for simple sequencing in which the challenges are obvious ham-handed bludgeons. And so I should be able to rely on a simple set of handling skills and look plenty good while doing so. But what am I going to do when I step on to a course designed by Scott Chamberlain or Tom Schulz? I just won’t be ready for it. The price of handling skill is practice. Over the next eight months or so I will endeavor to practice with my dog (and so inflict upon on my students) a variety of devilish challenges that require both analytical solution and handling skill. By the way, did I mention… Kory is a lot faster than me and seems to want to work at a brisk pace? The challenge in the opening of this course is somewhat subtle. 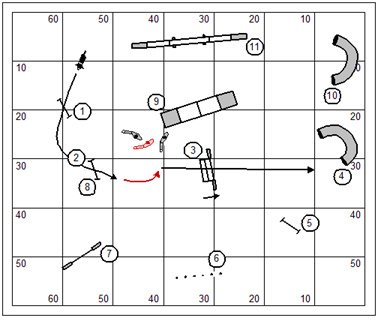 The 180° turn from jump #1 to #2 pins the handler at the top of the course and pretty much takes away the lead-out option (in the direction of the technical challenge, at any rate). The approach to the #4 pipe tunnel is the trick. Ostensibly it’s a straight line (that’s what the illusion suggests anyhow) from jump #2 nice and neat down into the pipe tunnel. The caveat I’ll throw in here is that a dog ahead of the handler tends to curl back to the handler’s position. So if the handler has dog-on-right then the dog favors the left side of the pipe tunnel as he curls back. 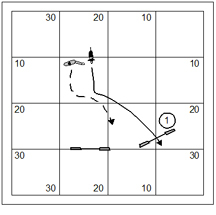 If the handler has dog-on-left the #5 jump opens up for the dog. Earlier on I suggested that the straight line from jump #2 into the right side of the pipe tunnel was an illusion. I need to draw a dog’s path or two to illustrate my point. The black line in the drawing demonstrates the path of the efficiently turning dog. The red path shows the route of the dog that might have required only another 5′ to negotiate the turn after jump #2. The black line path favors the wrong course entry to the pipe tunnel more than the correct entry. The red line path makes the wrong course entry to the pipe tunnel a near certainty. Whatever actually works is right. What I should really like to do is find four or five solutions that will work, and practice each of them. The key to success in dog agility is to have a broad repertoire of skills that are practiced to the extent of fundamental mastery. Should I say it again? The price of handling skill is practice. The first part of the puzzle is figuring out a way not to be trapped by the 180° turn through the first two jumps in the sequence. This drawing shows the handler sending the dog from a modest distance to do the first two jumps without supervision or micromanagement. This gives the handler a brief forward advantage simply in order to change sides to the dog. Having the forward advantage is one thing. What do we do with it? By the way, I’m expecting that for all the “forward” advantage I get with Kory, I’ll be behind him by the time he gets to the landing side of the spread-hurdle at #3. If there’s an element of this opening that will be challenging it will be for him to bring the #2 jump into focus. At 13 months old he probably has less obstacle focus for jumps than for any other obstacle. We will give this opening (and just the opening) considerable work. It’s my job to build that obstacle focus in him. What I’m showing here is a combination movement that I call the Post & Tandem. This is not to be confused with a “shoulder roll”; a contortion of the handler’s body to which I do not subscribe and I do not teach my own students. If a Post & Tandem fails it is invariably in the Post. So let me walk you through this. After jump #3 the handler shows a simple Post Turn. He will turn to address and present the #5 jump as though it were the next obstacle on course. As the dog turns away from the wrong-course entry to the pipe tunnel and take a stride towards jump #5 the handler will pitch back (this is the Tandem) to show the change of directions to the correct entry to the pipe tunnel. In the drawing I’ve actually exaggerated the dog’s path. The movement doesn’t really have to use up such a big piece of real estate. But trust me on this point, it’s better to use up too much real estate than too little. If a single simple movement has a single timing cue; then a combination movement must have a combination timing cue (one cue for the first part of the movement; another cue for the second part of the movement.) The trick to having perfect timing is to understand that timing isn’t about time at all, it’s about physical events and where the planets align in space. 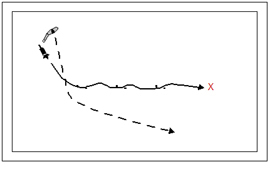 Another possible solution is to use a Rear Cross at jump #3 (a spread-hurdle) to effect the change of directions after jump #3. An important attribute of the Rear Cross is that it creates a tightened turn on the landing side of the jump. Of course the handler is faced with another turn, chiefly by use of a Tandem, after jump #3 as the #5 jump again has been presented as a wrong course option. It is not my intention to turn this into a lesson on the Rear Cross. That will have to be reserved for a separate discussion. There’s plenty that can go wrong with a Rear Cross. There probably is no movement that NQs more teams in competition than this. I consider the Rear Cross quite advanced, in spite of the fact that terribly novice handlers adopt it as a routine tool in an otherwise shallow repertoire of skills. 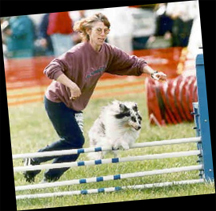 Ideally the handler will have taught the dog a pre-cue to the intention to change sides and directions when the Rear Cross is done at a hurdle. What more often happens is that the handler gives a startling and unexpected physical cue to the turn and change of sides when the dog is gathering to jump or on the approach to the jump. Having established that the straight line down to the correct entry to the pipe tunnel was a complete illusion, I need to back up and suggest that the handler can take some initiative to actually make the line straight. In this drawing I’m showing the handler using a squaring Front Cross to create the straight line. This is a special use Front Cross for this kind of application. Also, I suggested that a dog forward of the handler will tend to curl back to the handler’s position. This is one of the Laws of a Dog in Motion. However, I always tend to mumble under my breath the observation that “nothing straightens the line like the certainty in the mind of a well trained dog.” In this scenario if you have a good well-conditioned Go On, then the dog might be sent neatly down to the pipe tunnel even though the handler is going to be left way behind (in the dust). By the way, when I practice this I’ll be ready with a well timed “Left!” if my dog begins to curl to the #5 jump after the spread hurdle at #3. Now that we’ve established that the handler can reset the line to make the approach to the tunnel square; there’s more than one way to accomplish this. 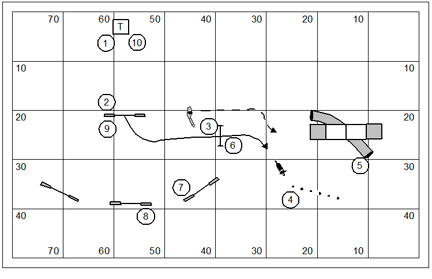 In this drawing I’m showing the handler doing an RFP to draw the dog in after jump #2 to set the corner of approach through the spread-hurdle so that it’s a nice straight line down to the pipe tunnel at #4. 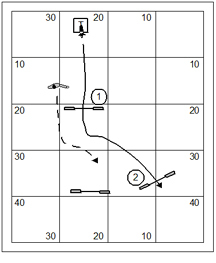 Note: The RFP is a combination movement: Front Cross to Front Cross. In the timing of the second movement, overdrawing the corner of approach will be more successful than not drawing the corner of approach in enough. Does this observation require a lot of analysis and discussion? I knew while writing all of the above that I was not exhaustive in my analysis. I didn’t talk about the possibility of a Get Out in the transition from jump #3 into the right side of the pipe tunnel; I showed the square at the top of the key as a Front Cross and not as a Post Turn; and I talked about no slow dog handling movements (forward and pulling) in the transition to the tunnel after jump #3 like the Front Cross, a Flip, or an RFP. I think I even left out a couple more besides! But my discussion gives me an interesting variety of training possibilities with my dog; and a basis for discussion to my own students who’ll be subjected to this tomorrow. In theory, theory and practice are the same thing; however in practice, they are often quite different. Here’s a riddle for you: If you don’t know what it is then it’s really something. If you know what it is then it can’t be much at all. What is it? Okay it was pretty cute in class tonight as Rene’s Tuzi did the teeter and rang a bell that had been placed in easy reach from her 2o2o dismount. It was just a lark… Rene had taught Tuzi to ring a bell for a food treat. So it makes a nice finish for a contact performance. Maybe we need to get it on You-Tube eh? My boy Kory has a tendency to come off sideways in his 2o2o dismount if I am too far away, lateral or behind. I’ve got this scheme working in the back of my head that I could teach him to ring the bell. Then I could use it on contact dismounts to teach him to come off straight. The bell becomes a secondary reinforcer and frankly a lure to shape the performance that I want. I’m having a lot of fun with Kory’s directional commands; left and right. It is bizarre to me that at just over one year of age he’s just nailing his lefts and rights… while he hasn’t even learned all the obstacles yet. Yes, I’ve saved the weave poles for last; he doesn’t completely understand the tire; and he treats the table like a trampoline. Here’s a fun sequence for directional control. On the dismount of the A-frame I’ll layer to the opposite side of the tire and #1/#6 jump. As he gets in the 2o2o I’ll wait a long pregnant moment and then tell him “Right! Tunnel!” Getting him to see the #6 jump is somewhat more problematic. Like I said… it’s bizarre. Okay I’m tired tonight. That accounts for my rambling tone. I started the day chopping vines in the woods. Yeah, that’s right. At a little “Y” intersection down below the training building the vines have killed three 40′ pine trees and a large oak. I’ve had to hack my way through the bramble of multi-flora rose and debris to find the mother plant… a sprawling creature with vine boughs bigger around than my biceps. I’ve already been three days cleaning up that bit… and dragging the cut-away to a bonfire arrangement below the training field. I’m transplanting some of the small trees coming up in that area. I have nearly 50 trees temporarily arranged until I can figure out where I want to move them to. A bunch won’t survive… but where they were, none of them would have lived more than a year or two as there would be no light for them in the understory. This evening I had a private lesson and two classes and our league game of the week. That was a good break. Tonight I’ll sleep well. Tomorrow morning I’ll go down and resume my war with nature. I have 300ish DVDs in my collection which is arranged in alphabetical order. With what titles does the collection start? You only get one guess. The first answer to name one of the first four in my collection, posted as a reply to this blog post, wins a free copy of the March Jokers Notebook. You are currently browsing the Bud Houston's Blog blog archives for March, 2010.